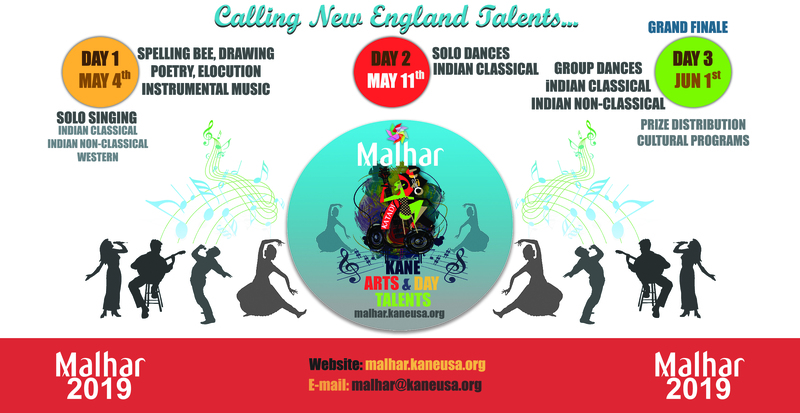 Malhar® is KANE's annual Arts & Talents Competition - this is a place for all the amazing talents in and around New England to come together and showcase their talents and wide range of skills. Whether you are a performer, or someone who just wants to enjoy a magical day - we welcome you! We invite both professional/amateur artists/performers, singers, dancers to come and show case their talents. There are amazing prizes to be won in each category. Must be 5 years or older to participate. When you register for Solo or Group Dance competitions, please enter the Dance School name to add points. To view complete schedule and timeline- CLICK HERE and scroll down to the bottom of that page to view under "SCHEDULE" tab. Proudly hosted by Kerala Association of New England (KANE). Poetry Writing Competitions. Separate Competitions for English & Malayalam. Note: Click on the "Register" button below to start registration. Spelling bee registrations are getting filled and will close the registration as soon as we reach maximum capacity in each grade. Don't wait, register now!